Cheap Retirement Living in the Caribbean...Changes in latitude. If you must have the 4 seasons; enjoy using your snowblower; have to wear your fur coat at least 5 times a year; or like to wear anything with a London Fog or Burberry label...this page may not be for you. We lived there for 8 years...loved every minute of it. Here is what I am talking about...from the Virgins in the north ...to Trinidad and Venezuela in the south. About 450 nautical miles of "No problem, Mon". Did we have a favorite island? Yep we sure did...whatever island we were on was our favorite. 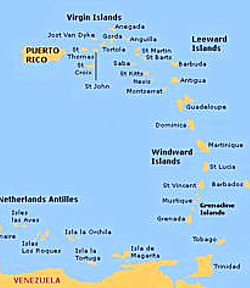 From Carnival in Trinidad (a must on your bucket list) to Race Week in Antigua to St Patrick's Day in St Croix...take your pick...with lots of "limin" in between. Jimmy Buffet knew what he was talking about when he said "changes in latitude, changes in attitude". You will not last long in the islands if you expect it to be "like home". You really chill, go with the flow, and soon will have a smug look on your face when you encounter a US tourist...next week they will be in the rat race...you'll still be here. You go to the islands to relax and enjoy yourself...just do it. The locals sure will be...might as well slow down and join them. Cheap retirement Living in the Caribbean...how cheap is it? 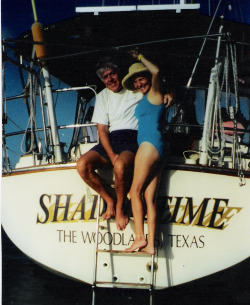 Once we got off the plane and on to our sailboat, we spent about a thousand dollars a month. That is cheap folks. I doubt anyone thought we were deprived either. We ate well, exercised,used public transportation and with other cruisers had a very active social life. Trust me every day was great and different. One of the reasons it is so cheap to live in the islands is what you wear. Guys, swim trunks and cotton T shirts. Gals, swimsuits and cotton cover up. For both Teva sandals, hat with brim (Tilley), and sunglasses with a cord around your neck. Why do you wear your sunglasses with a cord around you neck? You only watch 1 pair of sunglasses slowly sink to the bottom...then you go get a cord and put in around your neck. Like all the other boaters in the harbor. For church or a dinner ashore a collared shirt, cotton dress...man you are looking good and holding on to your money too. Because the Teva's, Tilley's and sunglasses with straps are the uniform of the day...cruisers are easy to spot. In fact, once on Mayreau we and our buds crashed a beach party from a cruise ship. After we ate and drank our fill we realized we were the only 4 people out of a 1,000 with Teva sandals. You wear them because you can get them wet. Thank you for the grub NCL...or was it Princess? Think of what you spend at home on TV and Cable, land line, newspapers and magazines, internet connections, etc. In the islands you watch TV at a bar, use pay phones and phone cards and go to the library to read magazines, get online and borrow books. Do I hear ca-ching? We are sports nuts, but one year we were on the plane to the US in May before we realized who had won the previous year's World Series or the Masters a month earlier. You get caught up with what has happened in the last 6 months or so in about 2 hours...then you realize, what on earth did I miss...Same O, Same O. That was before we used the library and internet but the point is the same. Cheap retirement living in the Caribbean...can you do it ashore? You may be saying I would like to live in the islands but have no interest in living on a sailboat. Pity...but you can live ashore cheaply, just not as cheap as on a boat. Anchoring is free so any housing costs would bump the thousand dollars accordingly. If you must have TV, phone, car you also have to account for that. Our last three years of cruising found us hanging in St Croix, anchored off the capital of Christiansted. The last 2 years we bought a beater island car , joined a gym (saved fresh water by showering there), and really lived it up. That increased our outgo by about $150 a month, but was well worth it. Yes folks you can enjoy cheap retirement living in the Caribbean. It is really cheap if your domicile floats. This also gives you the advantage that an RV gives you on land...don't like the neighbors...haul up the anchor and find a more pleasant neighborhood. Changes in latitude, changes in attitude...Jimmy is so right on. Enjoy.